I had a thought that grew into a dream. That dream went with me everywhere. It was with me at work. With me while I ate. I laughed with my dream and it smile back. My dream greeted me each morning and bid me goodnight as I lay down to sleep. My dream was even with me while I showered. More and more of my energy went toward my dream as it grew and grew. One day, quite miraculously, my dream turned into a star. It lived in my head, as real as real could be, until I could no longer contain it. I was not ready for the world to see my little star so I kept it in my pocket. Day after day it took shape and grew bigger and brighter. One day I felt it was time to share my little star with others. I gave a peek to those closest to me and they looked on my little star with awe and wonder. Some hailed it and proclaimed that it belonged in the heavens while others questioned if it were big or bright enough. Truth be told, I wondered the same thing myself. We were faced with two choices, my dream and I. Either my little star would remain tucked safely away in my pocket, where only I would know of its beauty and brightness, or we would endeavor to follow brave men and women into the celestial sky to place it among the stars. My fondest desire was to share my little star with all who might enjoy it, so the choice was easy. The journey, however, was not. With a deep breath and a prayer in my heart, I set off for the top of the mountain. I climbed the nearest peak and when I reached the summit I took my little star from my pocket and held it high, toward the heavens. We waited, my dream and I, for what seemed like an eternity. I gave serious thought to constructing a vessel of my own for the trip when at last a tiny sail boat floated through the sky as if in answer to my silent prayer. Grateful for the passage I gave no thought to its size or worthiness but leapt in before it could depart without us. 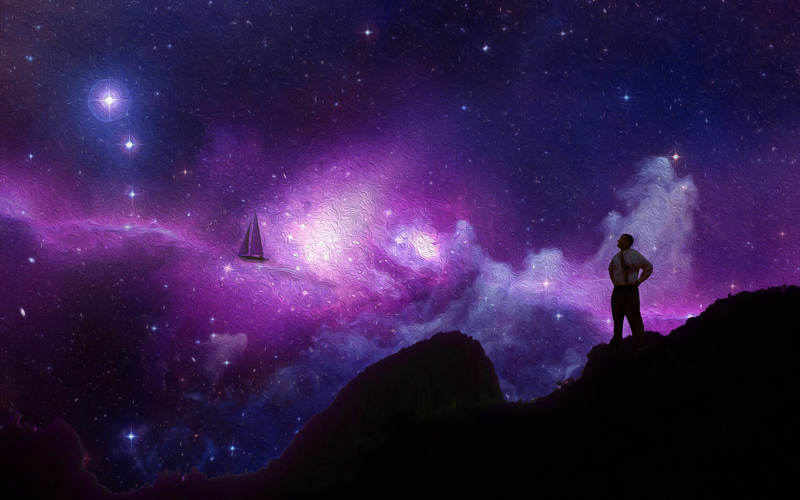 We sailed up into the great unknown toward a future of glorious possibilities. The journey was long but my little star and I reveled in the fact that we had been accepted into the vast galaxy above. With wide-eyed wonder we took in the passing cosmos on our way to our long sought destination. At last we arrived and I took my little star, gave it one last adoring look, and placed it with the other beautiful spheres of light. The joy I felt nearly caused my heart to burst. I returned to earth, full of excitement, to call for all of my friends and family so they might see the heights we had reached, my dream and I. They rejoiced with me and we celebrated together for a time. I spread the word far and wide that my dream had become a star and my star was in the sky for all to behold. Many came and looked upon my star. There were those who delighted in its splendor and whimsy. And others who did not find it as grand or brilliant as other stars they had seen. When I stepped back and took in the breathtaking tapestry of the universe, my little star seemed so insignificant and the prospect of anyone finding it on their own seemed so remote that my joy began to slip away. It was then I remembered where we began our journey and just how far my dream had come to take its place among the stars. It did not matter to me that it was dwarfed in size and brilliance by its glorious companions or that it might be lost to some among the infinite expanse of space. To me the only thing that mattered was how far we had come and what my dream had become. I do not know how long or how bright my little star will burn or how many will enjoy its light. But I now know what a dream can be and before I am through I plan on placing a few more stars in the sky.